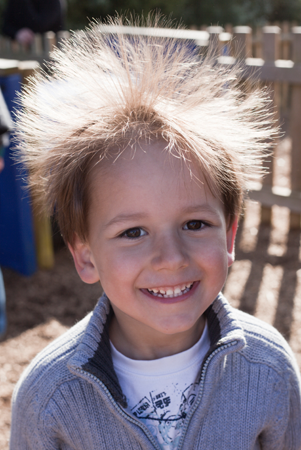 Kids dry hair and static electricity | Kids' Hair Inc.
An annoying and common winter problem, static electricity is especially attracted to children’s fine hair. The best way to deal with the flyaways is to make sure hair has enough moisture in it. Do not use “2-in-1′s,” bottles that contain shampoo and conditioner because they usually do not have the same moisturizing results as shampooing followed by a full-strength conditioner. Try using a leave-in conditioner such as Original Sprout, put it through wet hair and let it air dry. This will also help with combing out tangles. Use detanglers everywhere and liberally! On wet or dry hair, in hats, jacket hoods, car seats etc…We carry a variety of detanglers, such as Original Sprout Miracle Detangler, Paul Mitchell Taming Spray, and Circle of Friends.